(Seattle, WA — August 6, 2017) — The Seattle Art Fair, presented by AIG, culminated in strong sales and high public engagement with the fair’s Projects & Talks program. 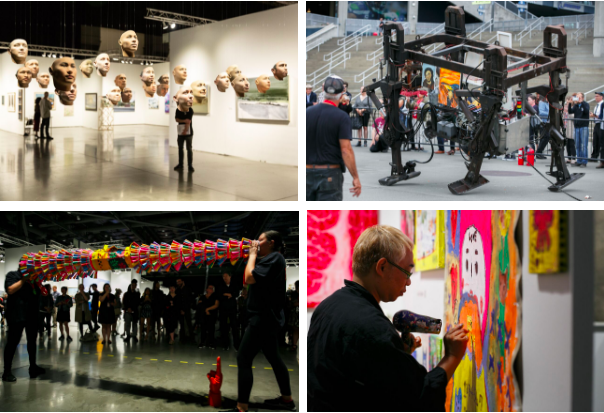 The fourth edition of the fair was the largest to date, with 106 exhibitors representing over 35 cities around the globe, including Berlin, Dublin, Kyoto, London, Los Angeles, Miami, Milan, Montreal, New York, Paris, Seoul, Stockholm, Tokyo, and Vancouver. Sustaining the growth from previous years, the fair had over 22,500 attendees throughout the weekend. "We are grateful to Seattle and the broader Pacific Northwest for its enthusiastic embrace of the fair, and were delighted to see so many significant out-of-town collectors attend this year. 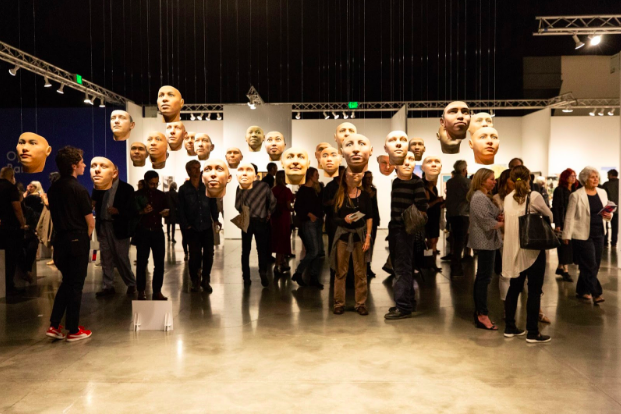 The public's extraordinary response to Nato Thompson’s program, coupled with tremendous support from collectors and institutions, made for a successful fourth year,” said Seattle Art Fair Director Max Fishko. “Art fairs are not only about commerce but the exchange of ideas. This past weekend, Seattle was a gracious host for both, and we are very much looking forward to next year." Photos Courtesy of the Seattle Art Fair. Please credit photographer if listed in photo caption. Clockwise from top: Mark Pauline's Survival Research Laboratories. Photo by Sunny Martini; Jennifer Levonian's Xylophone. Photo by Christopher Nelson; C Davida Ingram's Rootsystems and Ley Lines. Photo by Christopher Nelson. Courtesy of Seattle Art Fair. Frye Art Museum’s Director/CEO Joseph Rosa and curator Amanda Donnan selected a work by Toyin Ojih Odutola from Albuquerque’s Tamarind Institute and Ellen Lesperance from Portland-based galleryAdams and Ollman. The acquisitions were made possible by a $25,000 fund from the Seattle Art Fair in support of the museum’s new Contemporary Council. “We are proud to expand our collection to include two incredible artists, Ellen Lesperance and Toyin Ojih Odutola, and thank the Seattle Art Fair for supporting the growth of our institution,” said Frye Art Museum Director Joe Rosa. Wayne White's Here Come The Boren Sisters. Photo by Christopher Nelson. Courtesy of Seattle Art Fair. 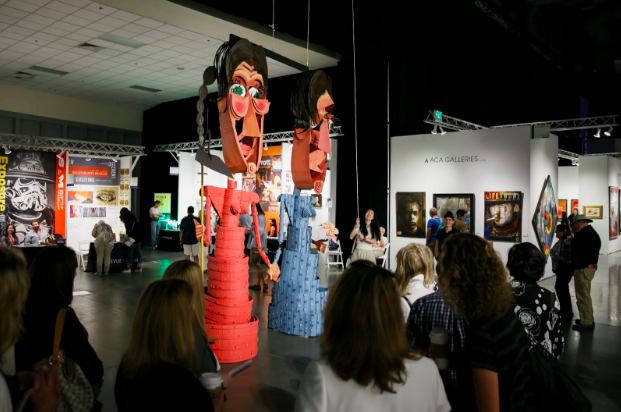 As part of the fair’s Projects & Talks, artist and Pee-Wee’s Playhouse set designer Wayne White created 14-foot puppets of Seattle pioneer women Mary Ann and Louisa Boren. These extraordinary, larger-than-life sculptures have been donated by the artist and Joshua Liner Gallery to the Montlake Elementary School in Seattle, where they will be on view to students and visitors indefinitely. Heather Dewey Hagborg's Probably Chelsea. Photo by Sunny Martini. Courtesy of Seattle Art Fair. Seattle Art Fair Artistic Director Nato Thompson presented a diverse program of Projects & Talks, including live robot demonstrations by Mark Pauline’s Survival Research Laboratories, Heather Dewey Hagborg’s Probably Chelsea, an installation of thirty 3D portraits of Chelsea Manning that were algorithmically generated by an analysis of her DNA, and Chris Burden’s Scale Model of the Solar System. Anishinaabe artists Charlene Vickers and Maria Hupfield’s large-scale cardboard megaphones presented a performance series to remind us that Seattle, the land of the Suquamish tribe, is a place whose future is rooted in its past. Local Seattle activist and artist C. Davida Ingram presented a multimedia project reimagining the 1999 World Trade Organization protests with indigenous and black people as central players in the “The Battle of Seattle” of past, present, and future. Clockwise from top: Trevor Paglen's Orbital Reflector. Photo by Christopher Nelson; Nato Thompson, Catharina Manchanda, and Tayyib Smith. Photo by Christopher Nelson; 2018 Seattle Art Fair. Photo by Sunny Martini. Over 100 national press outlets covered the fair and its exhibitor highlights, including Cultured Magazine, The Art Newspaper, Architectural Digest, artnet News, Galerie Magazine, ARTnews, and GeekWire, as well as many Seattle outlets including The Seattle Times, Seattle Weekly, The Stranger, KING5, City Arts Magazine, The Seattle Met, and Seattle Magazine.